Despite both being big hits on The CW, it's taken a while for Arrow and The Flash to get some great toys (we're still waiting on that Felicity Smoak from Toy Fair!). Funko are stepping in to fill the void with some new figures based on the shows... but you might want to hold off on being excited for them. Look, before someone accuses me of just hating the retro style of these figures, I think the ReAction figures have had some great toys, and there's some good figures that capture the Kenner style here really well. I think Canary and the Dark Archer are all actually decent retro-styled figures. Ollie definitely comes off short handed from the Arrow set, and slightly oversized head aside, Barry isn't all that bad either. It's just that the others don't really look all much like they're emulating the old Kenner style, they just look like they're cheap, crappy figures being sold exclusively to get on the "it's retro!" bandwagon. I mean come on. No hood! A random superfluous tie! They couldn't even given him a more accurate silver Cold Gun, like they gave Sara and Deathstroke silver accessories. This isn't Captain Cold, it's just some dude in a shirt and tie with sunglasses. There's a difference between embracing the retro aesthetic and just being damn lazy, and unfortunately this Captain Cold only does the being lazy bit really well. 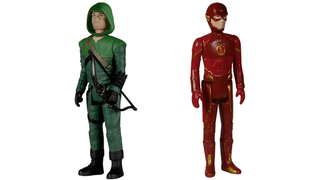 Both the Arrow and Flash ReAction figures will be out in July, for around $10 each. I don't know about you, but I think I'll keep waiting another month for this guy.